Pendaflex A-Z QuickView Desktop Project File - QuickVue Project File keeps daily projects within reach. Unique graduated indexes provide easy access to frequently used files. Stair-step design shows preprinted, double-top indexes at a glance. Four separate index colors provide unique, color-based filing system. 12 letter-size pockets are labeled A to Z for easy alphabetical filing. 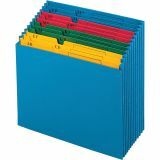 Store desktop file neatly in overhead binder bins or bookshelves.